For years, you've enjoyed relaxing with a cigarette in your hand, and looked forward to your cigarette breaks at work, but now, all of that smoking has caught up with you. You're coughing, wheezing, often out of breath. 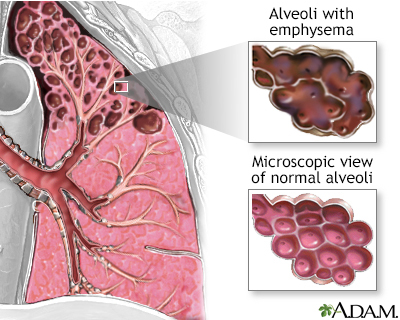 Could you have chronic obstructive pulmonary disease? Let's talk about chronic obstructive pulmonary disease, or COPD, for short. COPD is a lung disease that's usually caused by smoking, although some people who smoke for years never get the condition, while a few get COPD even if they've never lit up. Most people with COPD have a combination of a cough that just won't go away, called chronic bronchitis, and lung damage, called emphysema. The symptoms of COPD can sneak up on you slowly. Over time, you'll develop a cough that lingers, day after day. You'll feel tired, and have trouble catching your breath. Only your doctor can tell for sure whether this is COPD. 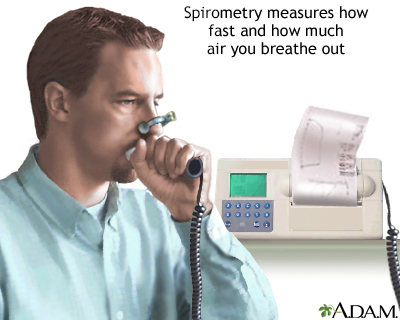 To test for it, you'll need to breathe or blow into a machine as hard as you can, and hold that breath, as long as you can, in a test called spirometry. You may also need to have a blood test to determine how much oxygen and carbon dioxide is in your blood. If you have COPD, the ways things stand now, you'll have it for life, as there is no cure for this disease. However, there are ways to control the condition and help you breathe more easily. The first thing you do, absolutely need to do, is stop smoking, which will help slow down the damage to your lungs. A few medicines can help relieve COPD symptoms. You may breathe in a bronchodilator medicine through an inhaler to open up your airways, or take steroids to bring down the swelling in your lungs. If you're having real trouble breathing though, call your local emergency services number. You may need to visit the hospital for oxygen or breathing assistance. You may also need to take antibiotics during flare-ups, because getting an infection can make your COPD worse. Though it may be hard to exercise when you're feeling out of breath, staying active will help keep your muscles strong. Your doctor can teach you how to breathe in a different way so that you can exercise with COPD. You can help avoid the shortness of breath, the coughing, and the wheezing of COPD by butting out, kicking your cigarette habit as soon as possible. Not smoking is the absolute best way to prevent COPD. Ask your doctor about programs and medicines that may make it easier for you to quit.